Featuring useful pots and pans that you’ll reach for every day, the Anolon Advanced cookware has some great features all cooks will appreciate. 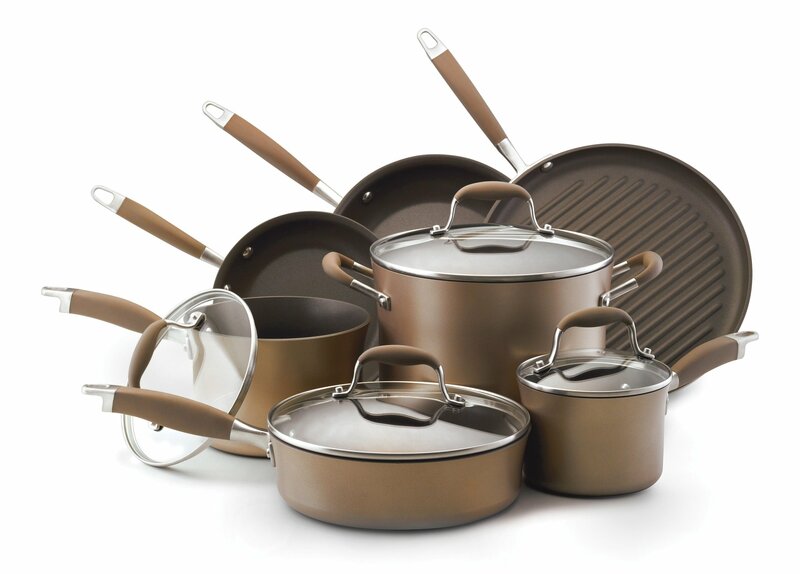 The Anolon Advanced Bronze Collection has a hard anodized construction and a nonstick finish. Some of the useful pieces you’ll find in this set are saucepans, a grill pan and skillets. Learn more about this set and why the Anolon Advanced Reviews at Amazon.com give it a solid rating. The Anolon Advanced Bronze Collection is constructed of hard anodized aluminum that is stronger than stainless steel. 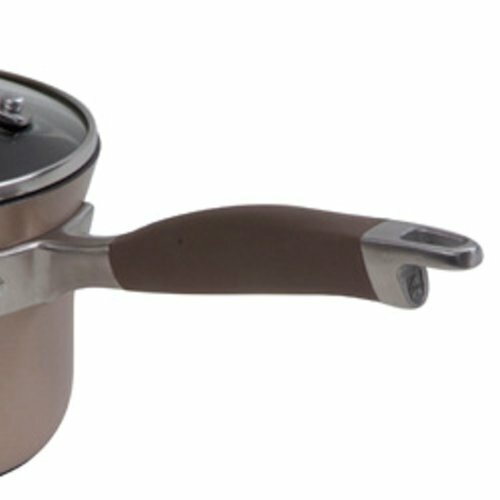 Hard anodizing leaves pots and pans very hard and durable, and the nonstick coating ensures they’re easy to clean. The construction of the Anolon Advanced Bronze cookware set ensures that the pieces heat up quickly and the heat gets distributed evenly, meaning less chances for “hot spots” and burnt food. 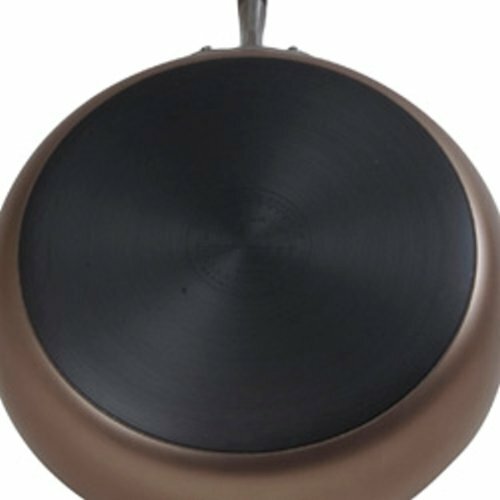 The Anolon Bronze handles are stainless steel that has been coated with silicone. They are double-riveted for strength and durability, and remain cool and comfortable to the touch while in use. The handles have loops at the ends for cooks that prefer to show off their collection on a rack, rather than store them in a cupboard. Finally, the Anolon Advanced Bronze Collection comes with break resistant glass lids that also feature stainless steel, silicone coated handles. I love the color of this set. It’s modern and chic looking, and yet has a classic look that is really neutral. I think it will fit in well with most kitchens. The handles have an interesting shape to them – the manufacturer refers to it as a “tulip” shape. Whatever you’d like to call it, it does give a nice twist on ordinary pot and pan handles. Reviews at Amazon were also positive in terms of the Anolon Advanced Cookware’s looks. Some of the comments found were “Gorgeous”, “Great Style”, and “Beautiful Set”. As far as “feel”, consumers found the set to be sturdy looking and a good weight. Not so light as to feel cheap, but not too heavy, either. As with many popular cookware sets these days, the Anolon Advanced Bronze Collection has see through glass lids that are break resistant. As you’re no doubt aware, repeatedly lifting the lids on pots and pans while cooking lets moisture and escape which can result in the loss of nutrients and taste. Having glass lids takes care of that problem, allowing us to sneak a peak at our culinary creations without disturbing the cooking process. The Anolon Advanced Bronze Collection is oven safe to 400°F. This is a bit lower temperature than some of the cookware sets I’ve reviewed, but should be adequate for most cooking. I would probably advise against placing them under the broiler, as broiler temps can often exceed 450°F. Anolon covers the Advanced Bronze Collection set with a Limited Lifetime Warranty. 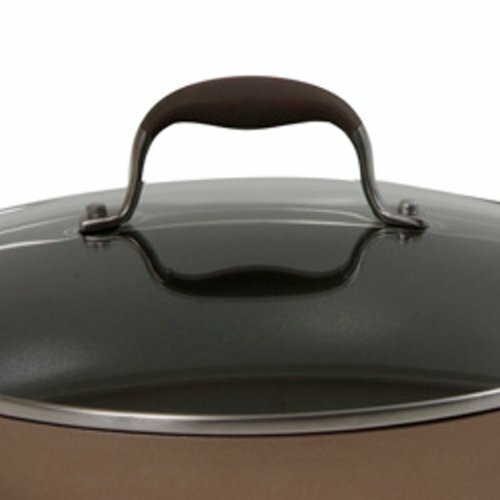 Hard anodized aluminum is known for its hardness and durability, and is found in many good cookware sets including the Anolon Advanced Bronze pots and pans. As mentioned previously, consumers found the set to be sturdy looking and have a decent weight. One reviewer at Amazon had been using the set for a year and stated that it was holding up great and still looked brand new. Most of the reviewers we found had only been using the set a relatively short time, so couldn’t speak to its overall longevity. With proper care, however, there is no reason this set won’t last for many years. You may be wondering, is the Anolon Advanced Bronze dishwasher safe? As with most nonstick cookware sets, they really should be hand washed to keep it in the best condition. While it can be more of a nuisance than just throwing the pieces in a dishwasher, the nonstick surface will prevent foods from sticking (which, we all know, is half the battle with cleaning up!). This set had one of the highest ratings on Amazon for hard anodized and non-stick cookware. There are lots of positive user comments that talk about the quality, appearance and usefulness of the set. Many reviewers commented on the quality of the set. Some of the comments found mentioned that the Anolon Bronze set is a good weight. The pots and pans are sturdy and heavy, yet light enough so as not to be uncomfortable to use and move around. As far as durability, a couple of users had been using the set for an extended period of time and said the pieces still look like new. With proper care, there is no reason the Anolon cookware won’t last for several years. Customers love the look of the set. While the bronze appearance isn’t for everyone, most felt that the set has a modern look, yet won’t be out of style anytime soon. Several people mentioned that they like the looks of the set enough that they are happy to display it on a rack versus leaving the pieces in a cupboard. The non-stick Teflon coating received rave reviews, as well. Many consumers stated that nothing sticks to the interior of the pan. Even foods like eggs, that are notorious for sticking to cookware, didn’t pose a challenge to the Anolon Advanced Bronze collection. One person remarked that the set cleans easier than any other set he’d previously owned. Another reviewer pointed out that hard anodized exterior makes the outside easy to clean also. The set comes with very useful pieces, including a grill pan. Reviewers state that the pans heat up quickly and evenly and that food cooks up evenly. Customers liked silicone coated handles, and verified that they stay cool and are comfortable to hold while cooking. A couple of people pointed out that the set isn’t dishwasher safe, but that didn’t seem terribly off putting to users. While hand washing does require a bit more time, because of the great non-stick coating, it really shouldn’t take any time at all to clean up the pots and pans after use. Overall, reviewers felt that the Anolon Bronze collection is a fantastic set that truly delivers quality for the price. Check out more reviews at Amazon, which also happened to have the best price I could find, at the time of this review.